Wood Badge is Scouting’s premier training course and leadership experience designed for all Cub Scout, Scouts BSA, and Venturing leaders as well as Council and District leaders and Scouting professionals. The founder of Scouting, Lord Baden-Powell, originally designed it so that Scouters could learn, in as practical a way possible, the skills and methods of Scouting. The Wood Badge course focuses on strengthening every volunteer’s ability to work with and lead groups of youth and adults. Learn more about Wood Badge at www.AlamoAreaBSA.org/WoodBadge or contact the Wood Badge team by email at WoodBadge@AlamoAreaBSA.org. The Wood Badge Committee is the “Council of Scoutmasters” that support a successful Wood Badge Course. Visit the Wood Badge/NYLT Committee page at www.AlamoAreaBSA.org/WBC. The object of the Wood Badge course is to demonstrate, as practically as possible, the aims and methods of Scouting. Upon successful completion of the course the participant receives a certificate and the Wood Badge – two wooden beads worn on a leather thong around the neck. These beads replicate the beads found by Baden-Powell during a campaign in Africa in 1888. They belonged to Dini-zulu, an African chieftain. In searching for a suitable recognition for those who completed the first course in 1919, Baden-Powell remembered the beads and decided to present a bead to each participant. From that time, the course was called Wood Badge. Scouting provides a natural bridge between the various programs in Scouting and leaders should understand the importance of transition. 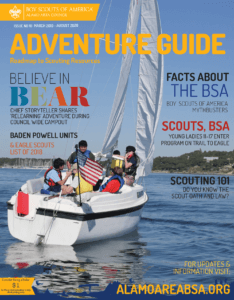 It would be difficult, and most likely confusing, to simultaneously model Cub Scouting, Scouts BSA and Venturing in one course. Wood Badge is advanced leadership training for adult leaders in all of Scouting’s program areas – Cub Scouting, Scouts BSA, and Venturing – as well as Council and District leaders. This includes assistant leaders, committee members, and even parents in all areas. Have completed the outdoor skills training programs if appropriate to your Scouting position. Be capable of functioning safely in an outdoor environment and have a BSA physical valid through the beginning of the course. If you are a Scoutmaster, Assistant Scoutmaster, or Webelos Den leader you must also complete the following training.